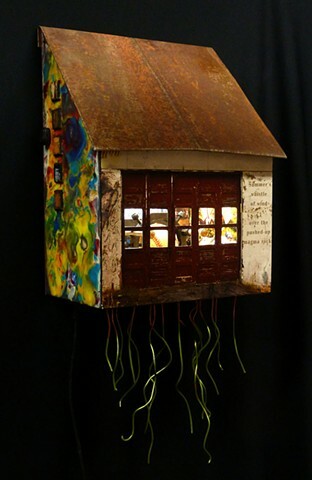 Originally shown at the Chase Gallery at City Hall in Spokane in the Spring of 2013, I made this little house (and another identical one – see Domicile: Extended Thanks), put on a rusted roof, lit the inside and then covered it inside and out with images created by Nance Van Winckel she calls “Photoems.” They utilize her poetry, photography and her Photoshop chops. The interior features a baseball bound in a slide projector holder mechanism for huge zoom lenses. The sides are finished in encaustic wax.